A cross between a Beagle and a Cocker Spaniel, the Bocker is as sweet as it is adorable. 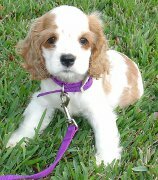 This is a less documented cross breed then its ‘designer breed’ counterparts, such as the Labradoodle and Puggle. That said, as a cross breed, it is very difficult to predict which parent the Bocker puppy will take after anyway. However, with both the Beagle and the Cocker Spaniel being such friendly and intelligent breeds, it is likely your Bocker will be just as sweet natured and fun to be around. Bockers are thought to be sociable and playful dogs, who love company. They do well with other dogs and even cats. They are not so good with very small children, as they are excitable and have a tendency to jump. They are easily trainable and protective of their family, but can be quite vocal (which would make them good watch dogs). Health wise they can suffer from the genetic disorders common to both their parent breeds, which include hip dysplasia, epilepsy, eye issues, joint and back problems, heart problems, patellar lunation, canine dilated cardiomyopathy, cancer and heart murmurs. Join this group to club together with other Bocker owners to get a great deal on pet insurance for your clever and gentle pooch.